The SC Morcha of Delhi State BJP organised the ‘Bhim Mahasangam Vijay Sankalp’ rally, an outreach programme on 06 January, 2019 at Ramlila Maidan, New Delhi. There are four main features of the event. The first feature is ‘Samrasta Khichdi’. Under this programme, the party Karyakartas collected a fistful of rice and lentils each from 3 lakh families of SC community as a symbol of support and pledge to make Shri Narendra Modi as the Prime Minister again. This exercise took three months time before the programme. Secondly, the BJP Karyakartas taking the help of Nagpur-based chef Vishnu Manohar cooked 5,000 kg Khichdi in one utensil using the rice and lentils collected from 3 lakh SC families to create a world record. 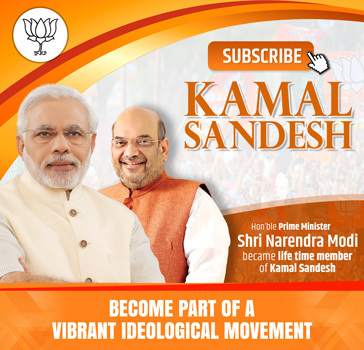 Thirdly, the Delhi BJP has prepared 14 lakh Sankalp Patras, to make this campaign successful. The SC Morcha workers contacted 14 lakh people through the Sankalp Patra. They have also apprised them of the public welfare schemes run by the Central government. The fourth feature was the massive ‘Bhim Mahasangam Vijay Sankalp’ rally, at Ramlila Maidan, New Delhi aimed to spread positivity and harmony in the society. Thousands of people gathered on the Ramlila ground for the ‘Bhim Mahasangam Vijay Sankalp’ rally and cries of Jai Bhim, Jai Hind, Bharat Mata ki Jai resonated at the Ramlila Maidan where party leaders said the event was more of a harmony-building exercise in the society rather than a political event. Among others BJP National General Secretary (Org.) Shri Ramlal, Union Ministers Shri Thawar Chand Gehlot, Shri Vijay Goel and Dr. Harsh Vardhan, Delhi BJP President Shri Manoj Tiwari and other leaders of Delhi State BJP participated in the programme. Addressing the huge gathering Union Minister Shri Thawar Chand Gehlot said Dr. BR Ambedkar was a patriot who returned to his country to work towards removing disparity. He spent his entire life on creating an atmosphere of harmony. He was a patriot. If he was not a patriot, he would not have come back to India despite being educated abroad where he also had the option of getting high-paying jobs. “He came back to India but did not opt for a highly-paid job, instead he chose to work towards removing disparities,” Shri Gehlot said. 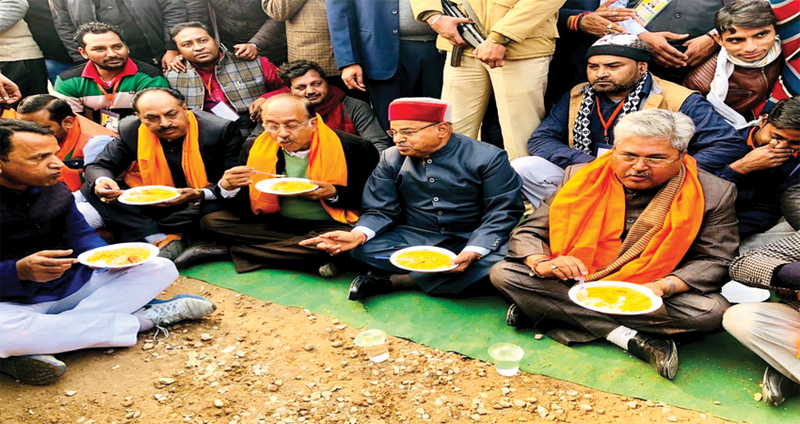 Union Minister Dr. Harsh Vardhan said by collecting a handful of rice and half a handful of lentils, the Delhi BJP is sending out a strong message of ‘’unity in diversity’’. Addressing on the occasion Delhi BJP President Shri Manoj Tiwari said this event sent a message to political parties not to indulge in divisive politics, but spread unity. “The dal and rice for this event has been collected from three lakh households and if they were not happy with us they would not have contributed. This khichdi has the message that PM Shri Narendra Modi will again become the Prime Minister,” he said. Taking a dig at the Congress and the Aam Aadmi Party, he said, “Arvind Kejriwal and Rahul Gandhi are you upset about the event? We had even invited every political party to be a part of the event. If they were concerned about harmony, Mamata Banerjee, Kejriwal, and others would have come,” he said. Speaking further about the Bhim Mahasangam, Delhi BJP SC Morcha President Shri Mohan Lal Gihara said the khichdi, which was cooked at the venue was served to around 25,000 people who thronged the Ramlila Maidan. Almost 5000 kilogram of ‘Samrasta khichdi’ was prepared at Ramlila Maidan on the occasion. The khichdi was prepared with 400 kg rice, 100 kg lentils, 350 kg vegetables, 100 kg desi ghee, 100 litres of oil, 2,500 litres of water and 250 kg spices, one of the cooks said. The 5,000-kg was cooked in one utensil, with rice and lentils collected from around 3 lakh Dalit households in the national capital with an aim to set a world record. The representatives from the Guiness Book of World Records were here to register the World Record and 5,000 kilogram of khichdi was eaten by around 25,000 persons.